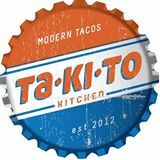 Located at 2013 West Division in Wicker Park, Takito Kitchen features Mexican-inspired cuisine created by Executive Chef/Partner David Dworshak and a complementary beverage program led by GM/Partner Adam Weber. The menu features seasonal shared plates, ceviche, tacos, soups and more with a focus on fresh ingredients and complex flavors, all tucked inside a homemade tortilla. The restaurant opens at 11 a.m. Tuesday through Sunday and is closed on Monday. We accept reservations via our website and Opentable and offer a texting option for walk-ins, where we record your name and phone number if a table is not available and send you a text message when a table becomes available. The space is industrial and modern featuring an open bar and kitchen and offers seating for approximately 80 people. Designed by D+K Architects and Interiors, the room includes an old skylight, long-cement bar, handcrafted maple benches, distressed cedar wood tattered with ebony stains, street art by local Chicago graffiti artists, and custom antique-style lighting. The open bar and kitchen design allows Adam Weber and Chef David to closely interact with the guests providing them with a heightened dining experience.